8. How do you format two columns of text in Word ? 10. There are two pictures overlapping each other in your newsletter. Both pictures are formatted with the Text Wrapping at Tight. a. Click the rainbow and go to Page Layout ->Arrange ->Send to Back. b. Right-click the rainbow and select Send to Back. 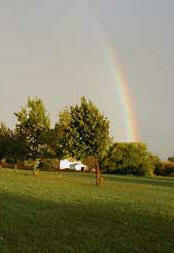 c. Click the rainbow and go to Picture Tools ->Format ->Send to Back.